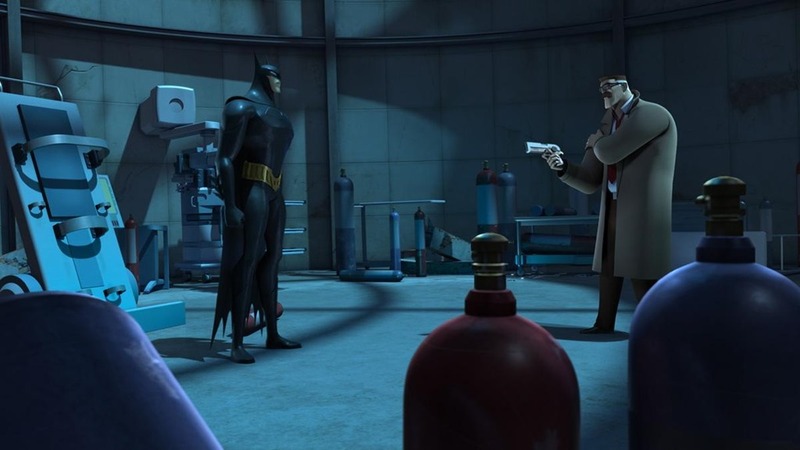 It’s time to see how Beware The Batman fared. It was a pretty original take on the Caped Crusader and the show also had a lot to live up to. Batman already had a few all star series in the form of The Animated Series and Brave and the Bold. Batman Beyond was excellent as well, although Batman didn’t really get to fight that much. Lastly, we can’t forget about The Batman. Does this show manage to take those out? Well, considering the episode disadvantage…it would be quite the feat! The series actually does have some plots that continue through the series. The first half is mostly stand aloneish, but we get to meet Katana and we are also introduced to Batman’s cast of villains. None of the all stars are here, but maybe that’s a good thing. When was the last time that we got to see Magpie and Anarchy steal the spotlight? Of course, then we’re reminded of Professor Pig and why we would have preferred the Mad Hatter. Anyway, back to the plot! Professor Pig and Mr. Toad are recurring villains, but they don’t have much of a master plan so I would say that Anarchy is the guy who really brings the plot. We also have the League of Assassins, who play a big role in Alfred and Katana’s past. Towards the second half of the show, we get a subplot where Batman is starting to become a little more vicious as he keeps to himself more since Alfred has left. Harvey Dent has also risen up through the political system and he wants to arrest Batman at all costs. It will award him the promotion that he needs! Meanwhile, Batman’s toughest foe has arrived in the form of Deathstroke. He’s going to need all of his skills if he wants to pull off a victory! Well, let’s address the elephant in the room. 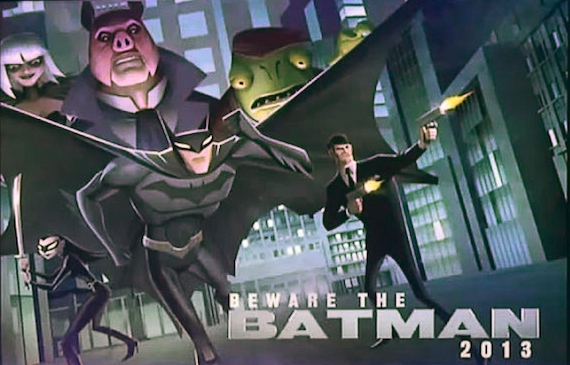 Is it true that the CG-I kept Beware The Batman from being a better show? Absolutely! The animation isn’t very bad and the character models are decent. At the same time, it’s hard to get excited when watching the show because of the stiff animation. A lot of the fight scenes will end up looking similar and the power levels are a mess. The animation just doesn’t let you really get into the episodes. A lot of the intros just don’t capture your attention and you know that the fight scenes won’t be able to match up to the original animated Batman show…which is around 20 years old at this point. For an example of the power levels, let’s just look at Batman’s fights. He got crushed by Magpie and Anarchy is able to hold his own against him. Then, Batman humiliates Silver Monkey, who is supposed to be an excellent hand to hand fighter. It just doesn’t make a whole lot of sense when you think about it. This happens all of the time. There are also a lot of moments where it’s Batman against the cops and the cops should actually win, but we won’t look at that too deeply since plot hax are usually required in those scenarios. Nobody is really able to deal with Gotham PD’s finest after all. The theme song is pretty lazy. It’s very short and it just doesn’t scream Batman the way that the Brave and the Bold’s intro did. I really liked the credits theme though since it has an epic feeling to it. Now, that could make you pretty excited for the next episode. Inside of the episodes, the music is pretty unmemorable. Usually, the scenes are fairly quiet so you can focus on the sound effects. That’s not a negative per say…but I wouldn’t call it a positive either! The show also made the intriguing decision not to use any of Batman’s iconic foes like the Joker, Penguin, Mr. Freeze, Bane, etc. We don’t even get to have Robin, Batgirl, or some of the others. (Barbara Gordan is here, but she’s so young that we wouldn’t get Batgirl for a very long time) I don’t mind digging out the obscure characters, but it’s better to use them sparingly instead of every episode. Towards the end, they started breaking out some popular fighters like Deathstroke and Killer Croc, but we were already wrapping up. I don’t think including the big villains would have saved the show from being cancelled, but I would have liked to have seen Mr. Freeze and Bane appear at least once. It would make the episodes more fun. As it is, I think Batman has one of the weaker selections of villains so I suppose that the show did what it could. All right, time for the comparisons. By this point you can probably already tell how the standings go. Beware The Batman get demolished by The Animated Series, Crushed by Beyond, Terminated by Brave and The Bold, and Humiliated by The Batman. I like to think that is easily beats the new Gotham show that is airing, but I won’t count that one since it would be a little too one sided! This Batman show still holds up well as a superhero show, but it just can’t be compared to those other titles. Again, if the show had not been CGI….we may be singing a different tune. (Still in last of course, but it would be closer) Batman also gets a possible romance subplot that arrives out of the blue towards the end of the series. The lady is pretty suspicious, but Batman doesn’t seem to suspect anything yet. I dunno…this all seems fishy and luckily the show ended before something dicey could happen! Batman’s portrayal is pretty solid for the most part, but there are definitely some iffy moments during the series. One of them is the fact that Batman actually lets his comrades eradicate the memory from one of the villains. This happens near the final episode of the series and it’s pretty awful. Did the writers not read one of the most iconic Justice League arcs in the comics where Batman made a point to prohibit such an action? It’s why he fought the team in the first place. It was pretty out of character for The Dark Knight. Another problem is that he just looks very weak throughout the series. I’m not expecting him to look quite as tough as Superman, but I still expect better. He lets Deathstroke know that he can’t defeat him in a fair fight on more than one occasion. It’s pretty laughable and Batman fans will want to turn off the TV. This isn’t the Batman that we remember! On the other hand, this Batman had some good traits. When he wasn’t making rookie mistakes or having trouble against foes with 0 hand to hand experience, Batman got to show off a lot of his detective skills. His best showing is probably when he solved the big puzzle that Humpty Dumpty threw him in. That also took place during the part of the show where Batman got a lot meaner since Alfred left. He went pretty far at some points, but I dare say that he looked his best during those moments. Alfred has changed a lot from his usual appearance. In this show, he’s an ex M-16 agent so he uses his government sources to find out any intel that Batman may have missed. He’s always got his gun at the ready and he even knows some hand to hand techniques. It’s all supposed to show us that he’s actually a pretty epic guy. Unfortunately, he still manages to lose a lot when the going gets tough. He deserted Batman at a rather dicey time to bring on some trouble to an old “pal” of his. His journey didn’t really have a point since he just ends up coming home empty handed and you have to wonder what he was doing. That certainly wasn’t one of his better moves. Seeing Alfred as a “Professional Agent/Fighter” was interesting….but I’m ready for the classic (Post plump) Alfred to return. That’s still his best era. Katana is basically the Robin of this show, but we see that she will be a little different right from the start. First of all, she is already a good hand to hand fighter when she joins. She gets a lot of hype although she doesn’t actually live up to it. She has a subplot involving the sword that she stole, a romance subplot with a pretty cheap character, and a subplot with someone who may have destroyed her father. So, she is pretty relevant to the plot, but 2/3 of those subplots didn’t go over very well for her. The romance is rather unnecessary here and Katana is always forced to play second fiddle to Batman. She cannot beat just about any enemy on her own and that can be a little sad for fans. If she always needs Batman to be around, then she’s not really helping out all that much. She likes to break the silence during an adventure with the occasional pun, but it typically doesn’t work. I have to say that I wasn’t really a fan of hers by the time the show ended. She got a little too much hype. Anarchy is one of the more interesting villains and he actually could be the best one in the show. He’s always presenting Batman with some dicey propositions and he forces the hero to play by his script. He’s not amazing at hand to hand combat, but he’s good enough to keep Batman busy for a while. He even fights with Katana at one point. He mostly stays in the shadows and eggs people on though since getting on the front lines isn’t really his style. He gets a whole lot of episodes so if you don’t like him, it’ll be a long ride. Deathstroke arrives for the final 3 or so episodes and he’s a pretty fun villain to have around. He’s definitely becoming DC’s Deadpool as we’ve seen him animated quite a few times as of late. This incarnation of him is better than the one in Son of Batman, but he still relies on using a lot of cheap tricks instead of just fighting Batman with his own skills. He only attempts a fair fight once and it doesn’t end well, which is why he must rely on his plans for their future encounters. You’ll likely figure out his secret identity right away since a new character joins the fray without any real reason at one point. It’s good to have a villain who isn’t being played by Anarchy so I give him some bonus points for that. As it stands, he’s one of the best villains in the series. Barbara Gordon’s role increases we we progress through the series. I think that they made her a little too young here though since she’s basically just a kid. There’s not a lot that she can do at this point so she’s currently tech support for the team. She basically skipped the Batgirl phase and became the Oracle right off the bat. Her romance subplot with a random kid in one episode was probably the low point of her appearances in this show. I definitely wasn’t much of a fan. She was all right when solving the puzzles and helping out, but then I would lose the respect when she started to act a little too smug and confident as she forced the Commissioner to do what she wanted to do. 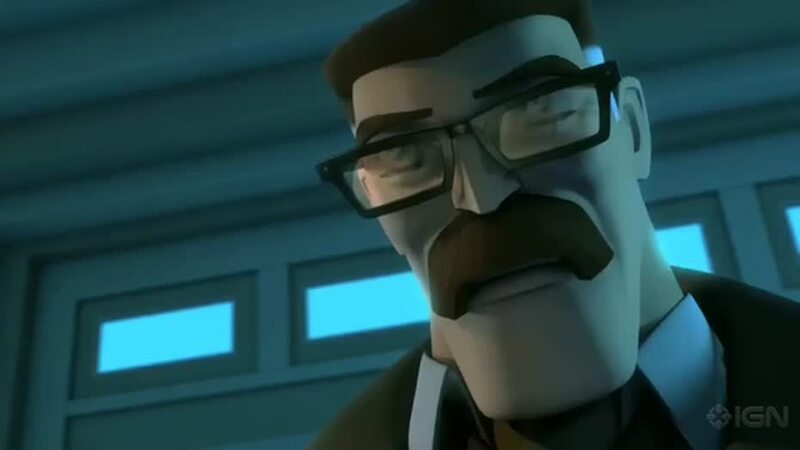 Commissioner Gordon gets a pretty small role in this show. He’s technically around a lot, but he is usually just there to be pushed around by Harvey Dent or get outsmarted by Barbara. He’s a good cop, but he’s just out of his league. At least he knows that Batman is good. (A quick thumbs up is awarded to such characters) He’s pretty true to his usual depiction and Gordon has always been a pretty consistent character. Harvey Dent gets a rather large role towards the end of the series as he does everything in his power to make life tough for Batman. The police are basically under his control (The special division anyway) and he attacks Batman no matter what the circumstances are. I’m sure that we were all waiting for his transformation into Two Face, but it’s safe to say that the show didn’t have a whole lot of time to show it. He gets a very brief role and he probably would have been more of a factor as a super villain in the next season. Despite that, he was pretty interesting as a corrupt politician. He always knew when it was the right time to insult Batmans or to take out his gun. Ra’s Al Ghul is really the same as always. He still likes to think that he is the greatest martial artist ever and he does humiliate Batman a few times. That being said, the show made him a little too strong and the heroes can only beat him with a nice spoonful of plot hax. He got a lot of hype and I was glad that he lived up to it, but his ending was pretty unsatisfying. He’s not a very interesting villain, but he’s tough so I give him some credit for that. If he would just lose the accent..it would be perfect! Lady Shiva is Ra’s right hand man and she looks pretty tough in her appearances. She takes on the combined might of Batman and Katana and she looks consistently good throughout the episodes. You can argue that she does get a little weaker by the end, but I’m sure that it happens to most fighters with these wonky power levels in effect. I’d consider her to be in the top 3 Beware The Batman villains and it’s nice to finally see her on the big screen. We need more serious hand to hand fighters to join the fray! She doesn’t get a whole lot of screentime..but she gets enough to get by. Killer Croc is the leader of the underworld in Arkham and it’s interesting to think about how he could have broken free from prison at any time. The cops definitely need to step up their game a little. He’s a pretty decent villain and his fight against Batman was probably one of the best fights that we saw in the series. He only appears in two episodes, but he left more of an impression than a lot of the other villains. I wouldn’t mind seeing him a little more although his role was a lot more petty in the second episode. Magpie doesn’t appear a whole lot, but she’s also fairly tough. Her personality is a little warped since the “accident” changed her, but now she has some super strength and speed on her side. She really does a number on Batman whenever they meet with the Dark Knight usually getting knocked out. She’s a pretty fun villain to watch, but I can’t say that I actually like the character that much. She wants to introduce more romance into the series, but we weren’t having any of that! Professor Pig is easily one of my least favorite Batman villains and the show really reminded me why he is not one of Batman’s more popular enemies. He just has no point as a character. He borrows some traits from the Joker while retaining a pretty polite attitude, but I don’t find him to be amusing. He’s also pretty weak since he’s overweight and he just likes to carry a big saw or knife. He’s no better than the average thug so he really shouldn’t be a match for the Caped Crusader. How he lasted so long I’ll never know. If his episodes had been replaced with a cooler villain, then that may have even helped the show. Mr. Toad typically works with Professor Pig and he doesn’t have a lot of character. Towards the end, he forgets his place and thinks of romance briefly, but I think it was mostly in a fake way. Either way, it didn’t exactly do him any favors in my eyes. Ironically, he’s actually tougher than Professor Pig, but I doubt that any of them would admit it any time soon. He’s just another uninteresting villain that I could have done without. There are some other fighters like Cypher, Silver Monkey, and Man Bat, but they don’t appear all that much or get a lot of personality. A guy by the name of Manhunter shows up and his story is rather dicey for a number of reasons. He vanished for quite a long time and he could have planned out things a little better. Metamorpho also gets a pair of appearances and he’s probably the toughest guy to appear in the series, but he doesn’t get to show off his strength. That’s pretty unfortunate, but without any tough villains…what are we gonna do! Beware The Batman also has to deal with the fact that Batman is fairly new to the business. I hope that the next show takes place after he has already been a hero for a while like in the Animated Series. That’s the Batman that everyone wants to watch anyway and it’s more fun when you know that Batman has the power of Prep Time! The show already had a number of disadvantages so getting rid of that one definitely could have helped out a little. The review may have come off a little negative, but the show just made more mistakes than you would expect from a show where Batman’s the main character. There were two pretty strong points to help the show along. One is the writing. The scenarios are pretty well thought out and the Humpty Dumpty episode comes to mind. The plots can be decently engaging even when the situations aren’t very intense and it’s all thanks to the script. Another good part of the show is the fact that we do get a lot of hand to hand fights. In an era where many shows have big DBZ styled fights with epic energy blasts, it can be fun to see a retro hand to hand fight. DBZ always wins, but you can’t have a winner without both sides right? Batman does manage to get knocked out about 2-3 times per episode, but that makes things interesting. Try ordering a slice of pizza every time he gets knocked out…it’ll be a fun wager! A good amount of action can make any show more interesting and this one has a lot of it. Overall, Beware The Batman is a show that I highly recommend to all Batman viewers. I would naturally recommend that you watch the other titles first, but if you’re a big Batman fan, then I’m guessing that you already have at this point. The others were pretty legendary after all. I may have qualms with the animation and the fact that the series had a lot of filler (or unimportant) episodes despite the fact that it was so short. There wasn’t enough Justice League build up either, which is pretty important for a Batman show. All of the titles that I mentioned earlier had the Justice League or was at least building up to it. This show just didn’t make the effort. Still, now you can tell people that you saw a CGI Batman and the show does manage to contain a lot of action scenes in its own right. It’s certainly of a higher quality than the current Hulk show or even the Pac Man cartoon that is airing. Now, we just need the next Batman show to be announced and we’ll be all set! This entry was posted in 7 Star TV Shows, Reviews, TV Show Reviews, TV Shows and tagged Alfred, Batman, Beware The Batman, CGI Cartoon, DC Comics, DC TV Show, Gotham, Gotham City, Katana, Review, Superhero Cartoon, TV Show Review by dreager1. Bookmark the permalink.